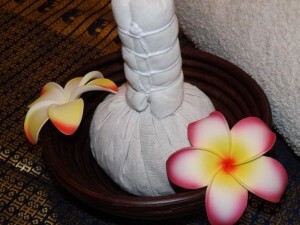 Herbal compress is a common method of treatment employed in traditional Thai medicine. The hot herbal compress contains numerous herbs tightly bound in fabric which is steamed until piping hot and firmly rolled. After a full-body, pressure point Thai massage, the hot herbal compess is pressed or pounded over the entire body in order to soothe muscle and stimulate the vital organs and senses. Compresses are traditionally applied after Thai Massage to prevent bruising, reduce muscle stress and cure skin conditions.